I have a large collection of whole spices that I prefer to use when cooking, rather than store bought ground mixes. I am always worried about what has gone into these mixes, and I can always make them at home in the quantity I need, rather than buy a particular blend and only use it once. Whole spices keep longer and are really simple to turn into ground spices if that is what your recipe calls for. All you need is a frying pan and a spice grinder. I have a very basic coffee grinder which I use to grind my spices. All I do is give it a good wipe after each use. I don’t use it for coffee though, as I don’t want any additional flavours in my morning cuppa. I was given a recipe which calls for Biryani mix and so I turned to my ever useful Curry recipe book, and used that as inspiration to make my own spice blend. I can really recommend that you try this method as you will find you waste less and seldom have to toss out spices as they won’t lose their oomph if you buy them whole. 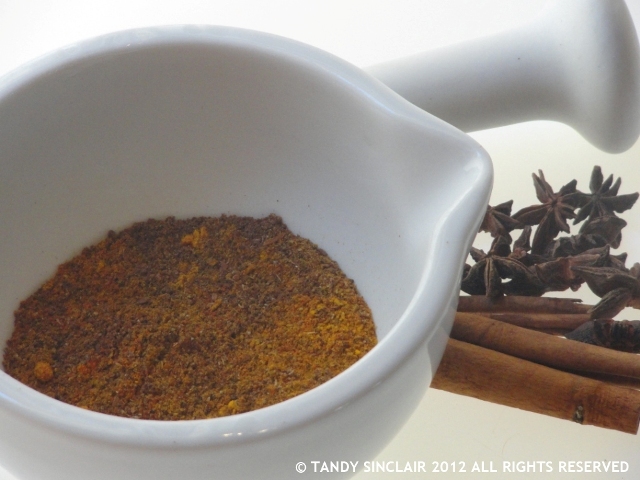 do you use whole spices in your kitchen? I always use whole spices – it keeps fresh much longer! Lovely mixture! Your spice mix sounds wonderful! I too, love to make fresh mix of spices. Although I do have some spices that I use regularly ground and kept well sealed in a little container. The taste of freshly ground spices really brightens up a dish! I have never made a biryani! This is the perfect inspiration, Tandy. Thank you. I love a good biryani…Hot and spicy!!! yum!! I have been wanting to start using more whole spices. I’ve heard they stay fresher whole, which makes sense. Then you can just grind what you need. I have noticed that I do prefer the flavor from a cinnamon stick to the ground cinnamon. Nice mix of spices…I yet have to make my own. I need to make my own mixes! It seems so simple and like it would be so much more flavorful. Gotta invest in some good quality basics first. I LOVE biryani! Thanks for this delicious post! I love Indian food and always make my own spice mixes, the lovely flavours emanating when dry roasting the whole spices make me anticipate the finished meal – my stomach is growling, what’s the matter? You are so right Barbara, the smell of the spices cooking is a great anticipation of the meal to follow! Oh dear, I have to hang my head in shame, I don’t make my own spice blends – I feel inspired to buy a few whole spices and experiment a bit. England is the curry capital of the world!